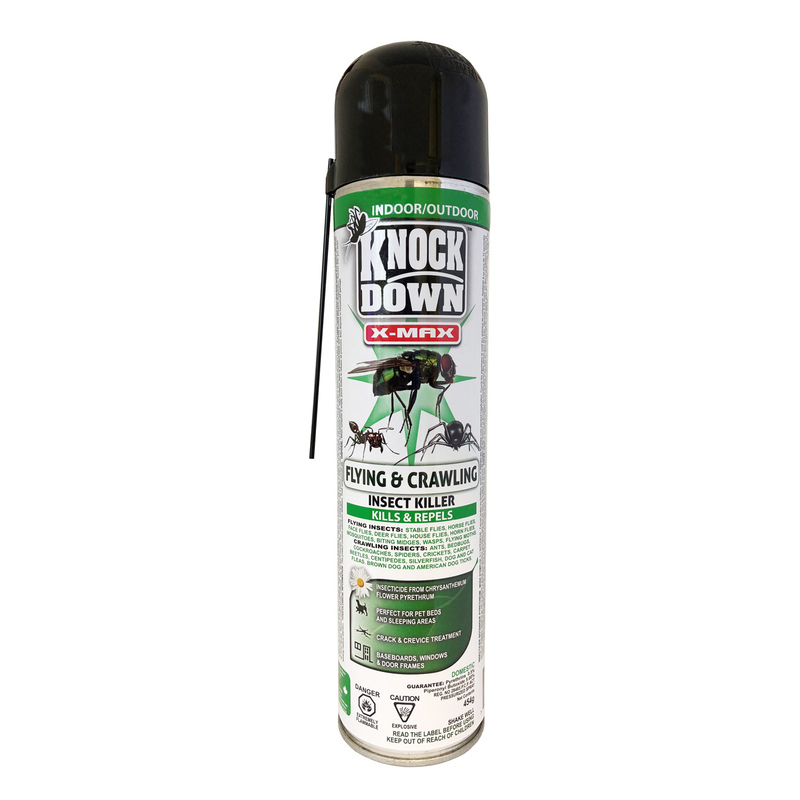 KD120D – KNOCK DOWN – X-MAX FLYING AND CRAWLING INSECT KILLER – KUUS Inc.
*KEEP PETS AND CHILDREN AWAY FROM SOLUTION UNTIL DRY. Inside Building Use: Close all windows, doors and extinguish open flames during treatment. Cover aquarium and remove pets. Apply at a rate of 15 seconds per 30m3 space. Direct mist upwards in sweeping motions to all parts of the building especially towards windows and other light sources where insects are present. Insects must be contacted to be killed. Keep spray at least 1m from interior walls, fabrics and furniture. Keep room closed for 30 minutes and then ventilate treated areas for 30 minutes before re-entry. contacted to be killed. Do not treat animals with this product. CRAWLING INSECTS: Apply to insect hiding places and breeding areas such as baseboards, moist areas, opening around sinks, drains and pipes, behind cabinet and storage areas. If possible, hit insects directly to kill. Spray ant trails, around door sills, window frames or in ant nest. Outdoor Use: Direct mist upwards in sweeping motions to all areas where insects are congregating such as garages, storage areas, barns. porches, under eaves, and around windows and doors. Insects must be contacted to be killed. ALWAYSREAD THE LABEL CAREFULLY BEFORE USING PRODUCT- click on the “PMRA” tab (Pest Management Regulatory Agency) tab to view the full label in English and French.